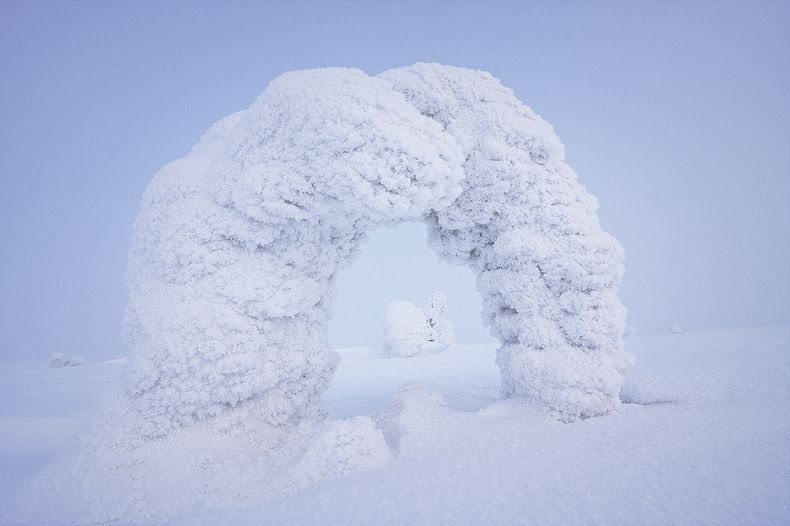 One of the most beautiful places in the world, whose landscapes may serve as a reason for postcards, is the Finnish region called Lapland. 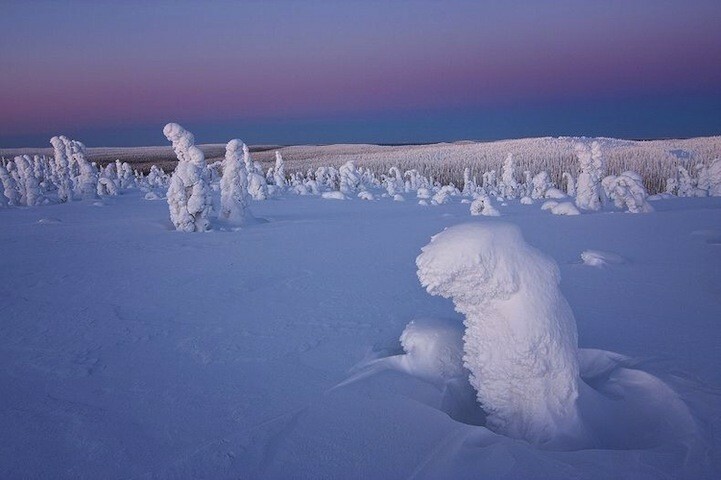 An extraordinary phenomenon occurs during the winter, the trees are covered with ice and snow in such way that adopt shapes, which giants who take care of the land north: the sentinels of the Arctic. 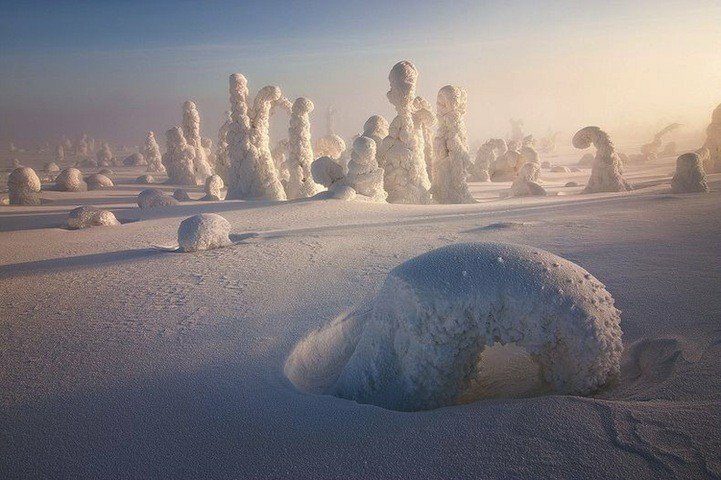 The Italian photographer Niccolò Bonfadini traveled to Finnish Lapland in winter and endured temperatures up to -40°C to obtain these images that seem to be from another world. Perhaps as that will send a future probe exploring a planet with traces of intelligent life. The armor of ice, or cloud texture of coral, are actually frozen trees, patiently awaiting the end of winter for greening in a silent dream. 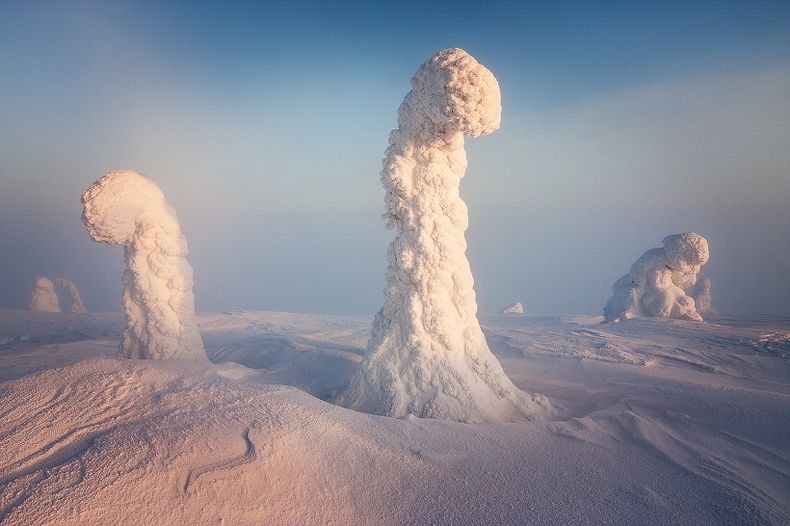 Bonfadini titled these beings “Sentinels of the Arctic”, and a couple of years ago one of these images was chosen as the image of the day on the popular NASA APOD website. Haunted these trees of ice beauty is enhanced by the soft colors of dawn, blue light, roses, violets and the sunlight that spreads like a divine foam. At dawn, all crops against sky of soft blue tones, hollyhocks and roses, which produces a fascinating spectacle. This phenomenon is called Belt of Venus and is another of the attractions of the region that makes contrast with the Arctic infinity. It is so named because it occurs when Venus shines and can be seen clearly. Although the Finnish Lapland weather conditions are so extreme, the truth is that after those layers of ice seem to live fish and marine mammals whose evolutionary mechanisms have allowed them to remain there. The white giants are their guardians, which on the surface ensure that it is only a matter of waiting a few more months to return to its plant origins. 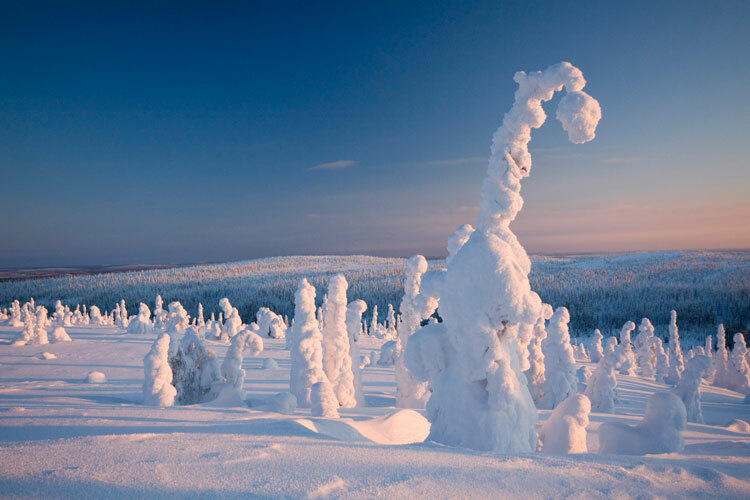 Lappish traditions have turned these trees ice cream in magical creatures who watch these Nordic landscapes. However, with spring, breaks the spell, the ice melts and the sentinels of the Arctic become simple green trees that also embellish this amazing place on the planet.